Welcome to the Temple of Roxolotyl, by Rocko of course. This fresh take on an ancient civilizaiton rarely depicted in LEGO really contrasts well with the other castle creations in Rocko’s repertoire. Note the well planned brick pattern on the steps and the unattended fire in the backyard. There’s a lot to like here. That’s a whole lot of cylinder pieces — and smooth tile pieces. Love the cobblestone effect. I’m also liking the skull with the flowery eyes! Gorgeous. 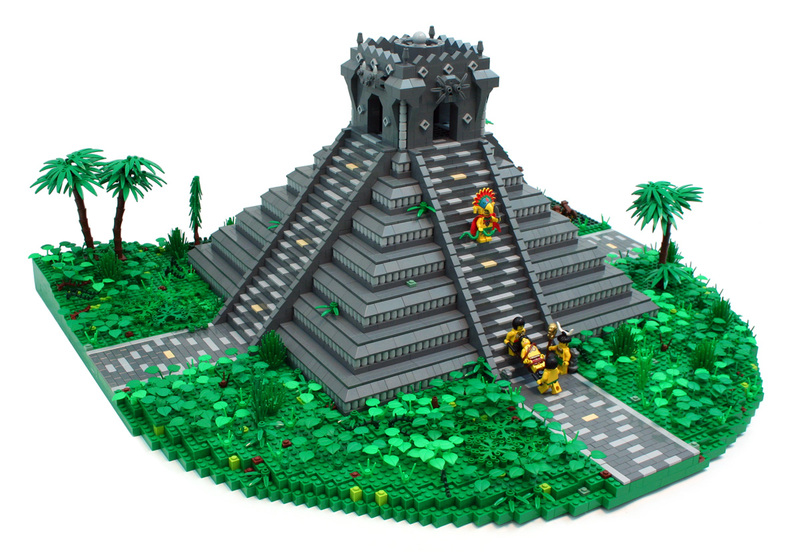 A great Mesoamerican style pyramid needed to be built out of Lego. I thought it needed to be built by me, but Rocko did it better than I would have. Wow, really appealing work. The museums should be lining up around Rocko’s block to try buying this. I was down in Costa de Maya and Cozumel about a month ago. This really reminds me of how the area was described by our guide from when it was inhabited. Based on what we were told, they’d sometimes tie the captives up in a ball and roll them down the stairs to kill them.